Eutrophication is the enrichment of an aquatic ecosystem with chemical nutrients, typically compounds containing nitrogen, phosphorus, or both. Although traditionally eutrophication is defined as enrichment of aquatic systems such as lakes, bays, or other semi-enclosed waters (even slow-moving rivers), there is gathering evidence that terrestrial ecosystems are subject to similarly adverse impacts (APIS, 2005). The increase in available nutrients promotes plant growth, favoring certain species over others, and forcing a change in species composition. In aquatic environments, enhanced growth of choking aquatic vegetation or phytoplankton (that is, an algal bloom) disrupts normal functioning of the ecosystem, causing a variety of problems. Human society is impacted as well: eutrophic conditions decrease the resource value of rivers, lakes, and estuaries such that recreation, fishing, hunting, and aesthetic enjoyment are hindered. Health-related problems can occur where eutrophic conditions interfere with drinking water treatment (Bartram et al. 1999). Eutrophication can be a natural problem, such as the natural aging of a lake as nutrients come from streams draining into the body of water, or it can be advanced by addition of nutrients from agricultural runoff (such as fertilizers), sewage, and industrial wastes. There are various measures that can reduce human impacts while remaining a sustainable solution for everyone, including farmers and ranchers (see prevention and reversal). Eutrophication was recognized as a pollution problem in European and North American lakes and reservoirs in the middle of the twentieth century (Rohde 1969). Since then, it has become more widespread. 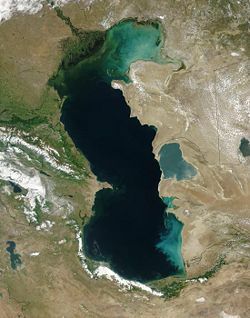 Surveys have shown that 54 percent of lakes in Asia are eutrophic; in Europe, 53 percent; in North America, 48 percent; in South America, 41 percent; and in Africa, 28 percent (ILEC/Lake Biwa Research Institute 1988-1993). Eutrophication can be a natural process in lakes, occurring as they age through geological time. A newly formed lake may have very little nutrients, but increase in nutrients, and plant life, as runoff carries nutrients into the lake. Eventually, the lake may increase in fertility to the point that organic matter accumulates, algal blooms occur, and rooted plants gain a foothold. Also, estuaries tend to be naturally eutrophic because land-derived nutrients are concentrated where run-off enters the marine environment in a confined channel (Bianchi et al. 2000) and mixing of relatively high nutrient fresh water with low nutrient marine water occurs. However, human activities can accelerate the rate at which nutrients enter ecosystems. Runoff from agricultural activities, pollution from septic systems and sewers, and other human-related activities increase the flux of both inorganic nutrients and organic substances into terrestrial, aquatic, and coastal marine ecosystems (including coral reefs). Elevated atmospheric compounds of nitrogen can increase soil nitrogen availability. How eutrophication works in an estuary (from US Environment Protection Agency). Chemical forms of nitrogen are most often of concern with regard to eutrophication because plants have high nitrogen requirements—additions of nitrogen compounds stimulate plant growth (primary production). Nitrogen is not readily available in soil because N2, a gaseous form of nitrogen, is highly stable and basically unavailable to higher plants. Terrestrial ecosystems rely on microbial nitrogen fixation to convert N2 into other chemical forms (nitrate, for example). However, there is a limit to how much additional nitrogen can be utilized. Ecosystems with nitrogen inputs in excess of plant nutritional requirements are referred to as nitrogen-saturated. Over-saturated terrestrial ecosystems contribute both inorganic and organic nitrogen to freshwater, coastal, and marine eutrophication, where nitrogen is also typically a limiting nutrient (Hornung et al. 1995). However, in marine environments, phosphorus may be limiting because it is leached from the soil at a much slower rate than nitrates, which are highly soluble (Smith et al. 1999). Numerous ecological effects can arise where primary production is stimulated, but there are three particularly troubling ecological impacts: decreased biodiversity, changes in species composition and dominance, and toxicity effects. When a body of water experiences an increase in nutrients, primary producers reap the benefits first. This means that species such as algae experience a population increase (called an algal bloom). Algal blooms tend to disturb the ecosystem by limiting sunlight to bottom-dwelling organisms and by causing wide swings in the amount of dissolved oxygen in the water. Oxygen is required by all respiring plants and animals in an aquatic environment and it is replenished in daylight by photosynthesizing plants and algae. 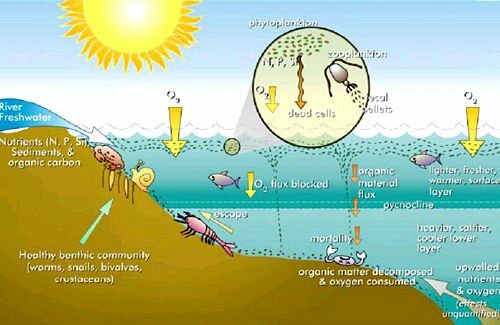 Under eutrophic conditions, dissolved oxygen greatly increases during the day, but is alternately greatly reduced after dark by the respiring dense algal population and by microorganisms that feed on the increasing mass of dead algae. When dissolved oxygen levels decline to hypoxic (oxygen-defficient) levels, fish and other marine animals suffocate. As a result, creatures such as fish, shrimp, and especially immobile bottom dwellers die off (Horrigan et al. 2002). In extreme cases, anoxic (lack of oxygen) conditions ensue, promoting growth of anaerobic bacteria such as Clostridium botulinum that produces toxins deadly to birds and mammals. Zones where this occurs are known as dead zones. Eutrophication may cause competitive release by making abundant a normally limiting nutrient. This process causes shifts in the species composition of ecosystems. For instance, an increase in nitrogen might allow new, another competitive species to invade and outcompete original inhabitant species. This has been shown to occur (Bertness et al. 2001) in New England salt marshes. Some algal blooms, otherwise called "nuisance algae" or "harmful algal blooms," are toxic to plants and animals. Toxic compounds produced by the algae can make their way up the food chain, resulting in animal mortality (Anderson 1994). Freshwater algal blooms can pose a threat to livestock. When the algae die or are eaten, neuro- and hepatotoxins are released that can kill animals and may pose a threat to humans (Lawton and Codd 1991; Martin and Cooke 1994). An example of algal toxins working their way into humans is the case of shellfish poisoning (Shumway 1990). Biotoxins created during algal blooms are taken up by shellfish (mussels, oysters), leading to these human foods acquiring the toxicity and poisoning humans. Examples include paralytic, neurotoxic, and diarrhoetic shellfish poisoning. Other marine animals can be vectors for such toxins, as in the case of ciguatera, where it is typically a predator fish that accumulates the toxin and then poisons humans. There are also toxic effects caused directly by nitrogen. When this nutrient is leached into groundwater, drinking water can be affected because concentrations of nitrogen are not filtered out. Nitrate (NO3) has been shown to be toxic to human babies. This is because bacteria can live in their digestive tract that convert nitrate to nitrite (NO2). Nitrite reacts with hemoglobin to form methemoglobin, a form that does not carry oxygen. The baby essentially suffocates as its body receives insufficient oxygen. Point sources are directly attributable to one influence. In point sources, the nutrient waste travels directly from source to water. For example, factories that have waste discharge pipes directly leading into a water body would be classified as a point source. Point sources are relatively easy to regulate. It has been shown that nitrogen transport is correlated with various indices of human activity in watersheds (Cole et al. 1993, Howarth et al. 1996), including the amount of development (Bertness et al. 2001). Agriculture and development are activities that contribute most to nutrient loading. There are three reasons that nonpoint sources are especially troublesome: soil retention; runoff to surface water and leaching to groundwater; and atmospheric deposition. (Smith et al., 1999). Nutrients from human activities tend to accumulate in soils and remain there for years. It has been shown (Sharpley et al. 1996) that the amount of phosphorus lost to surface waters increases linearly with the amount of phosphorus in the soil. Thus, much nutrient loading in soil eventually makes its way to water. Furthermore, phosphorus has the capacity to be released from the soil after a lag time of ten years. Nitrogen, similarly, has a turnover time of decades or more. Nutrients from human activities tend to travel from land to either surface or groundwater. Nitrogen in particular is removed through storm drains, sewage pipes, and other forms of surface runoff. Nutrient losses in runoff and leachate are often associated with agriculture. Modern agriculture often involves the application of nutrients onto fields in order to maximize production. However, farmers frequently apply more nutrients than are taken up by crops (Buol 1995) or pastures. Regulations aimed at minimizing nutrient exports from agriculture are typically far less stringent than those placed on sewage treatment plants (Carpenter et al. 1998) and other point source polluters. Nitrogen is released into the air because of ammonia volatilization and nitrous oxide production. The combustion of fossil fuels is a large, human-initiated contributor to atmospheric nitrogen pollution. Atmospheric deposition (e.g., in the form of acid rain) can also effect nutrient concentration in water (Paerl 1997), especially in highly industrialized regions. 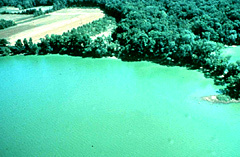 The bright green water in the Potomac River estuary is result of a dense bloom of cyanobacteria. Any factor that causes increased nutrient concentrations can potentially lead to eutrophication. In modeling eutrophication, the rate of water renewal plays a critical role; stagnant water is allowed to collect more nutrients than bodies with replenished water supplies. It has also been shown that the drying of wetlands causes an increase in nutrient concentration and subsequent eutrophication booms (Mungall and McLaren 1991). Eutrophication poses a problem not only to ecosystems, but to humans as well. Reducing eutrophication should be a key concern when considering future policy, and a sustainable solution for everyone, including farmers and ranchers, seems feasible. While eutrophication does pose problems, humans should be aware that natural runoff (which causes algal blooms in the wild) is common in ecosystems and thus it is not necessarily advisable to have a goal of reversing nutrient concentrations beyond normal levels. Cleanup measures have been mostly, but not completely, successful. Finnish phosphorus removal measures started in the mid-1970s and have targeted rivers and lakes polluted by industrial and municipal discharges. These efforts, which involved removal of phosphorus, have had a 90 percent removal efficiency (Raike et al. 2003). Still, some targeted point sources did not show a decrease in runoff despite reduction efforts. Studies show that intercepting non-point pollution between the source and the water is a successful mean of prevention (Carpenter et al. 1998). Riparian buffer zones have been created near waterways in an attempt to filter pollutants; sediment and nutrients are deposited here instead of in water. Creating buffer zones near farms and roads is another possible way to prevent nutrients from traveling too far. Still, studies have shown (Agnold 1997) that the effects of atmospheric nitrogen pollution can reach far past the buffer zone. This suggests that the most effective means of prevention is from the primary source. Laws regulating the discharge and treatment of sewage have led to dramatic nutrient reductions to surrounding ecosystems (Smith et al. 1999), but it is generally agreed that a policy regulating agricultural use of fertilizer and animal waste must be imposed. In Japan, the amount of nitrogen produced by livestock is adequate to serve the fertilizer needs for the agriculture industry (Kumazawa 2002). Thus, it is not unreasonable to legislate that livestock owners clean up animal waste, which when left stagnant, will leach into groundwater. Soil Nitrogen Testing (N-Testing) is a technique that helps farmers optimize the amount of fertilizer applied to crops. By testing fields with this method, farmers saw a decrease in fertilizer application costs, a decrease in nitrogen lost to surrounding sources, or both (Huang et al 2001). By testing the soil and modeling the bare minimum amount of fertilizer needed, farmers reap economic benefits while the environment remains clean. Although the intensity, frequency, and extent of algal blooms has tended to increase in response to human activity and human-induced eutrophication, algal blooms are a naturally-occurring phenomenon. The rise and fall of algae populations, as with the population of other living things, is a feature of a healthy ecosystem (Bianchi et al. 2000). Rectification actions aimed at abating eutrophication and algal blooms are usually desirable, but the focus of intervention should not necessarily be aimed at eliminating blooms, but towards creating a sustainable balance that maintains or improves ecosystem health. Anderson, D. M. 1994. Red tides. Scientific American 271:62-68. Angold P. G. 1997. The impact of a road upon adjacent heathland vegetation: Effects on plant species composition. The Journal of Applied Ecology 34:409-417. Air Pollution Information System (APIS). 2005. Eutrophication Retrieved December 15, 2007. Bartram, J., W. W. Carmichael, I. Chorus, G. Jones, and O. M. Skulberg. 1999. Chapter 1. Introduction, In: Toxic Cyanobacteria in Water: A Guide to Their Public Health Consequences, Monitoring and Management. World Health Organization. Bertness, M. D., P. J. Ewanchuk, and B. R. Silliman. 2002. Anthropogenic modification of New England salt marsh landscapes. Ecology 99:1395-1398. Bianchi T. S., E. Engelhaupt, P. Westman, T. Andren, C. Rolff, and R. Elmgren. 2000. Cyanobacterial blooms in the Baltic Sea: Natural or human-induced? Limnol. Ocenogr. 45:716-726. Buol S. W. 1995. Sustainability of Soil Use. Annual Review of Ecology and Systematics 26:25-44. Cole J. J., B. L. Peierls, N. F. Caraco, and M. L. Pace. 1993. Nitrogen loading of rivers as a human-driven process. Pages 141-157 in M. J. McDonnell and S. T. A. Pickett, editors, Humans as Components of Ecosystems. New York, NY: Springer-Verlag. Hornung M., M.A. Sutton, and R. B. Wilson., eds. 1995. Mapping and modelling of critical loads for nitrogen: A workshop report. Grange-over-Sands, Cumbria, UK. UN-ECE Convention on Long Range Transboundary Air Pollution, Working Group for Effects, October 24-26, 1994. Published by: Institute of Terrestrial Ecology, Edinburgh, UK. Horrigan L., R. S. Lawrence, and P. Walker. 2002. How sustainable agriculture can address the environmental and human health harms of industrial agriculture. Environmental health perspectives 110:445-456. Howarth R. W., G. Billen, D. Swaney, A. Townsend, N. Jaworski, K. Lajtha, J. A. Downing, R. Elmgren, N. Caraco, T. Jordan, F. Berendse, J. Freney, V. Kudeyarov, P. Murdoch, and Z. Zhao-liang. 1996. Regional nitrogen budgets and riverine inputs of N and P for the drainages to the North Atlantic Ocean: natural and human influences. Biogeochemistry 35:75-139. Huang W. Y., Y. C. Lu, and N. D. Uri. 2001. An assessment of soil nitrogen testing considering the carry-over effect. Applied Mathematical Modelling 25:843-860.
International Lake Environment Committee(ILEC) and Lake Biwa Research Institute. 1988-1993 Survey of the State of the World's Lakes. Volumes I-IV. International Lake Environment Committee, Otsu and United Nations Environment Programme, Nairobi. Kumazawa, K. 2002. Nitrogen fertilization and nitrate pollution in groundwater in Japan: Present status and measures for sustainable agriculture. Nutrient Cycling in Agroecosystems 63:129-137. Lawton, L. A., and G. A. Codd. 1991. Cyanobacterial (blue-green algae) toxins and their significance in UK and European waters. Journal of Soil and Water Conservation 40:87-97. Martin, A., and G. D. Cooke. 1994. Health risks in eutrophic water supplies. Lake Line 14:24-26. Mungall, C., and D. J. McLaren. 1991. Planet Under Stress: The Challenge of Global Change. New York, NY: Oxford University Press. O’Brien, J. W. 1974. The dynamics of nutrient limitation of phytoplankton algae: A model reconsidered. Ecology 55, 135-141. Paerl, H. W. 1997. Coastal eutrophication and harmful algal blooms: Importance of atmospheric deposition and groundwater as "new" nitrogen and other nutrient sources. Limnology and Oceanography 42:1154-1165. Raike, A., O. P. Pietilainen, S. Rekolainen, P. Kauppila, H. Pitkanen, J. Niemi, A. Raateland, and J. Vuorenmaa. 2003. Trends of phosphorus, nitrogen, and chlorophyll a concentrations in Finnish rivers and lakes in 1975-2000. The Science of the Total Environment 310:47-59. Rodhe, W. 1969. Crystallization of eutrophication concepts in North Europe. In: Eutrophication, Causes, Consequences, Correctives. National Academy of Sciences, Washington D.C.
Sharpley, A. N., T. C. Daniel, J. T. Sims, and D. H. Pote. 1996. Determining environmentally sound soil phosphorus levels. Journal of Soil and Water Conservation 51:160-166. Shumway, S. E. 1990. A review of the effects of algal blooms on shellfish and aquaculture. Journal of the World Aquaculture Society 21:65-104. Smith, V. H., G. D. Tilman, and J. C. Nekola. 1999. Eutrophication: impacts of excess nutrient inputs on freshwater, marine, and terrestrial ecosystems. Environmental Pollution 100:179-196. This page was last modified on 3 April 2008, at 20:17.